Bad Idea's first 7" is full of scrappy pop charm. Normally when trying to find an obscure DIY band, you can simply type in their name followed by the word "bandcamp" to cut through the bog of related search terms. 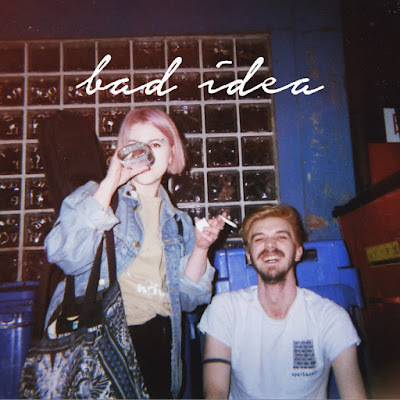 No such luck with Leeds-based garage duo Bad Idea. There are a lot of Bad Ideas out there, but they’re not all as scrappy charming as this Time Waster / Boy Racer 7”. It’s a rushed and sloppy recording, which is appropriate for a poppy band who thanks alcohol and Madonna for bringing them together. The real gem on the EP is “Boy Racer,” a song about the age-old appeal of bad boys. Sarah Sefton sighs, “There’s something bout boys in cars” as a two-chord riff kicks in. As the song romps along, Sefton pines for the dude to take her somewhere new, somewhere at all, even if it’s just his bedroom floor. The trope takes a turn as Sefton maintains the rose-colored glasses of a Bad Boy Crush while pulling no punches about the guy’s faults. “Oh please don’t blow smoke in my eyes,” she sings as she rides stoned passenger side with all of his friends in the car. These sorts of crushes only work when you keep buying into the fantasy of how you want this boy to treat you. How maybe he’ll take you somewhere new for a change, or how nice it would be for him to call instead of loudly and inconveniently arriving on your doorstep. Bad Idea blows through all of these faults before fixating on the possibility of him calling instead. “Oh that would be sweet,” Sefton sings over and over as the bridge mounts. The A-side is a complete reversal of that dynamic. “Time Waster” is about a sweet sucker who is desperate for Sefton to be smitten, but she isn’t down. “I see the want in your smile / You’re so obvious,” she sighs dismissively. It’s not a kiss-off. It’s a sad realization that you are hurting another person because you can’t love them in the full way they need. This 7” might not catapult the duo to quasi-indie fame. It will serve the purpose of a first release of a punk band: something to give people looking at an event page on Facebook some idea of what kind of gig their going to. I, for one, am very sad I can’t book this band to play at my pal’s house in Brooklyn. Listen to Bad Idea on bandcamp.